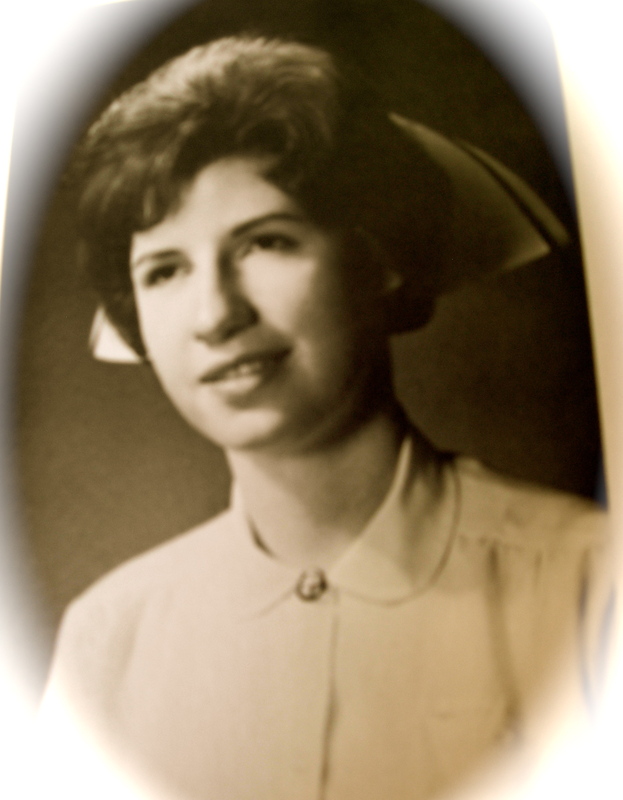 I graduated from nursing school fifty years ago this month. I still remember this man. The long, dark hall stretched out in front of me. It was eleven-thirty in the evening, close to the end of my shift. The thick soles of my Red Cross shoes silenced my step as I checked each room on the medical unit of St. Peter’s Hospital. The evening was hushed, almost mellow. Thoughts of impending freedom from the student role danced in my brain.In a couple of months I would be graduated, trading the blue and white striped dress with starched white bib and apron for an all-white uniform and getting a pay check. Three hours before, I had done the perfunctory PM care. Quietly, I reached into the bedside table, took out the stainless steel basin and filled it with warm water, wrapped the washcloth around my hand to make a mitt, and glided along the heavy creases of his weathered face. I washed his beefy limp hands. X-rays showed that no bones were broken when the tree fell on him. Carefully folding his left arm and leg over his body and with a couple of pushes, I shoved him over to his right side. The pillows wedged into his back and under his knees and arms kept him in place. He looked comfortable. With little experience to gauge the severity of damage, I wondered if Mountain Man would be alive when I came back the next evening. The following day when I checked my patients, I was surprised to see him sitting up in bed. Over the next two evenings he steadily improved. He walked out of the hospital on his own four days later. But not before telling me what went through his mind during his illness. As he lay in a comatose state he thought he was dead. There came a warm glow about the room. A kind and gentle angel appeared and ministered to him, softly washing his face and hands, turning him to make him comfortable. He knew then that he would get better. Graduation fell on a clear, cool day in early September. Three full years of nursing school were ending. The Bishop presided over the ceremony, which took place in a cathedral in downtown New Brunswick, New Jersey. I joined hands with the forty-four women of the class of ‘62. Clad in crisp white dresses and winged caps, we swayed as we sang our class song, Scotch and Soda, in the drafty field house. The melancholy moment competed with a sense of new beginnings. After the ceremony the evening mist circled around the crowd lingering outside the church. I searched for my parents. Mom wore her imitation mink and Dad had on his Sunday suit and a fedora hiding his thinning brown hair. A man standing silently to the side under the light of a street lamp caught my attention. His hands folded in front of him. A warm smile crossed his face. I stopped and stared. Mountain Man had come to see me graduate. This is a tearjerker! A memory that will plant itself into readers’ hearts. The story not only shows the “science” (the actual caring “for” the patient) of nursing, but showcases the “art” of nursing–caring “about” the patient. Vivid images. Thanks for giving us this insight into what nursing can be. Sometimes I wonder if we became nurses at a time when we could truely “care” for the patient. Today’s busy high-tech environment is challenging to the “art” of nursing care. Yes, if not careful, the art can get sacrificed. Wonderful story, Marianna! So many memories. We had our annual banquet today-12 from our class of 1962 were there. We missed you and everyone else who couldn’t come. St. Peter’s truly gave us a good start on our nursing careers-your story told of the wonderful hands-on-care that we all loved about nursing.Your Mountain Man appreciated you . Thanks for sharing. Certainly the rigorous instructions of the nuns who taught us rubbed off. Such a touching story. What a beautiful way to start off your career. It was a much simpler and gentler time in health care services. I love this story! Thank you for sharing. It so eloquently illustrates the comforting power of simple bedside nursing care. What a tribute to you as a young nurse, that Mountain Man came to your graduation to show his gratitude. Much like your practice in the “comforting power” of Reike. Oh yes….Reiki is all about the comforting power of touch. Wow! I love that. A mystical aspect to it for me. Thanks, Marianna! A beautiful story! The starched uniform, the cap, the shoes brought back pleasant memories for me. Congratulations on your 50th anniversary and thank you for sharing it with us. This one made me cry !! Ruth D.
The nuns taught us well. I love the fact you can view so many sides of a story. Such a beautiful post. I’m so happy you are fulfilling your original intent with this blog – Nursing stories are BIG stories.